With over lay on the left sides, and installed as an interior mural, the span is 14 1/2 feet. Augusta Sparks Farnum with panel from Triptych. Graphite. Mural Paper. glaze. Acrylic. Diptych. Graphite. Mural Paper. glaze. Acrylic. 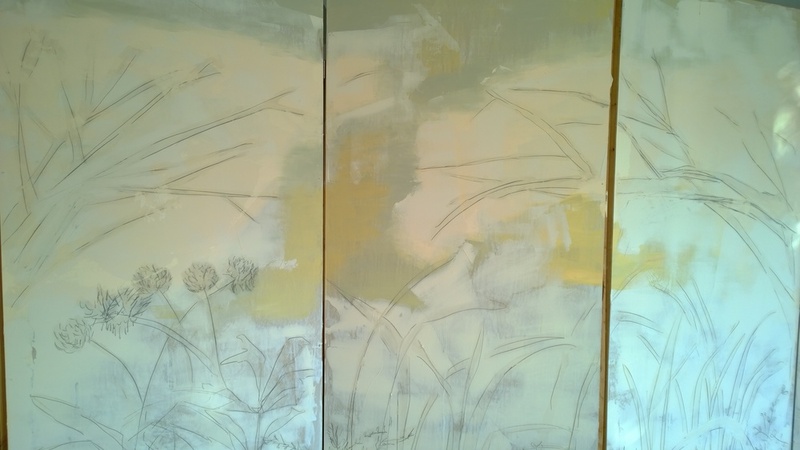 2 panels, each 5 feet by 8 feet 6 Inches. When installed as a interior mural the span is 10 feet wide. The show was successfully shot by Jenna Gard at the Walla Walla Foundry, prior to hanging. The diptych and the triptych are both composite photographs to show the work together. Although these are large works, they are no bigger then a wall in your home. The work has been an illuminating experience, making mural drawings in my studio for a show space. This is a video by Bill Anderson. The universe is pleased to announce the opening of Augusta Sparks Farnum's new body of work, "Besides the Garden" at Brasserie Four. Augusta's new pieces explore the breeched greenhouse, the forced entry of the garden into the interior space. For Augusta, the interior space is understood to be the surrounding interior of our physical existence, the home, the office, the studio, the school, the restaurant. It is also the interior of our physiological existence, the heart, the lungs, the breasts, the kidneys, the womb, the brain. Walking into her studio over these last six months conjures a dream memory of a humid summer adventure. Hacking through kudzu with a repurposed rebar machete, you find yourself in the unhinged doorway of a forgotten arboretum. The branches have sluiced through the cracks, winding around mullions, overpowering the shattered panes and gaps in the framing. Breaking and entering, filling the gaps, and encompassing the fractured room. They find the light, and redistribute their infinite branching. The garden has entered the building. exploring the ancient & dynamic surface of etched metal. come support the artists & their curiosity. Melissa Christy, Augusta Sparks Farnum, Smokey Farris, Doug Gisi, Anne Haley, James Harley, Seymour King, Margaret Walters, Travis Weige, & Lynn Woolson. curated by Artist Claire Johnston. all work is for sale, please contact Hannah MacDonald for more details & gift arrangements. For this event I spent the fall working in 4 directions. 5 paintings, all from my work outdoors here at The Fern. I couldn't get enough of the idea around "polishing firewood," a great quote I once read. More musings using the etched work I started with the Smokey Good Group, on engraved black walnut, with a nod to my dear friend Bear. These little etching & engravings were a bit like a poem, or an illustration you could hold in your hand. This winter, I brought to the public, my hand painted leather mittens, art for the rugged invidualist. The children and I wear these regularly for dog walks and bike rides with beauty. Lastly, I worked on a etched switched stainless steal plates, I have a feeling there will be more of these in my future. Dashed with my line & honoring the nasturtium. Although this quick event has come and gone( it was only three days!) some of my million dollar ideas are listed in the shop. Ah yes, another step towards becoming a shop keeper. The group show was a another great collection of Walla Walla artists work. The artist group has changed over the last year, and so has the art. I can't wait to see what's next. The Six by Six season has come. 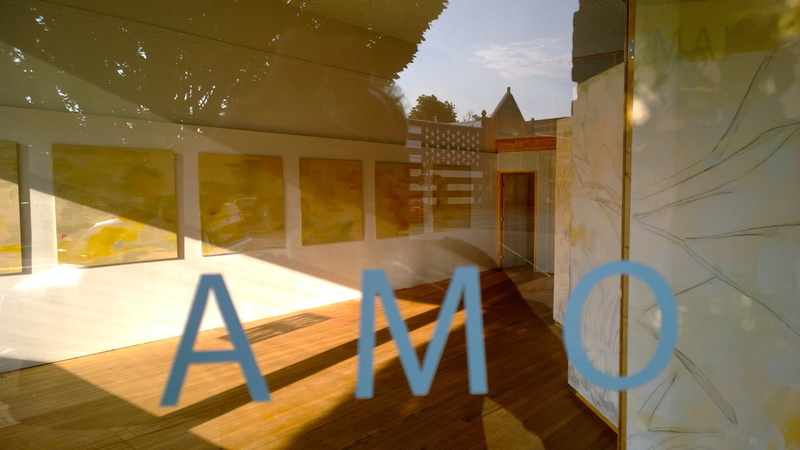 Althought the grab and go event has ended, a group gallery show at Cavu Cellars stays through the fall. ArtWalla thank you, for yet again, pulling off an outrageous event. The work I submitted was from two places. Mainly from the extensive garden's of Beth Thiel and Brian Wolcott. Painted to honor the vigor many of us benifited from. Their family filled more land, then many of us have in Walla Walla, with tomatos to beets and everything in between to fill mouths, and freezers. Their work grown to fortify friends with illness. Their family altered many lives, with gifts of beauty and nutrition. How could I not be drawn to the rows of color and choas and generousity? Secondly there was my neighbor's plum tree: the laying of fruit, grass, the ladders of support, and the juicy flesh. Oh my. The late treasures of summer insisted on color I rarely move toward, purple in its many hues. The remaining painting, hanging in the Cavu Cellar's ART WALLA group show, speaks to my new mind. The past months intensive brought forth a new relationship with color. Not an element I am particularly known for, I am laying the ground work for this year's adventures. Spacially, still relying on my Photographic training, it is any thing but realistic. It is emotive and it is suggestive. Now, just imagine that 20 feet by 20 feet. After Purchasing A morning's Walk, at the Telander Gallery, Walla Walla, Janet Byerly asked to have a small, some what airy drawing to assist in the installation. A month later, I finished the final glaze to find A garden of Transplants had grown into the place of white walls and minimal surroundings. 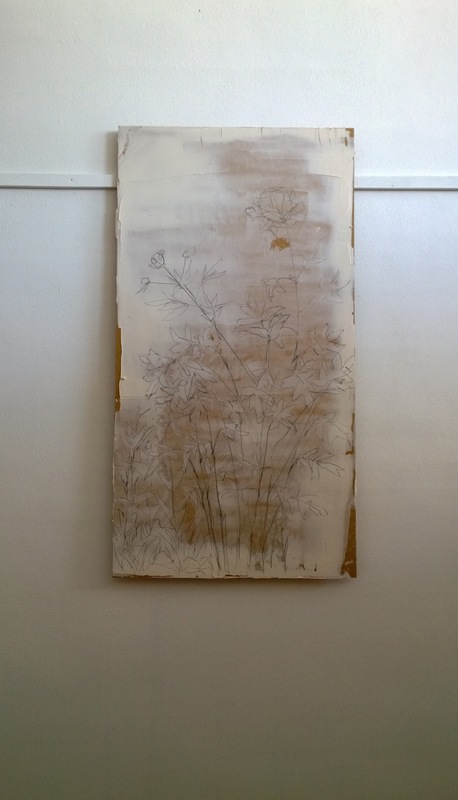 WALLA WALLA, WA - Walla Walla based artist Augusta Farnum opens “Equivocal Space”, an installation of new botanical drawings, abstract sculptural pieces, and atmosphere paintings. A reception for the artist will be held on Thursday May 8th, from 5:00 – 7:00 PM at Telander Gallery, 34 S. Colville Street in downtown Walla Walla. The show continues through June 21st. 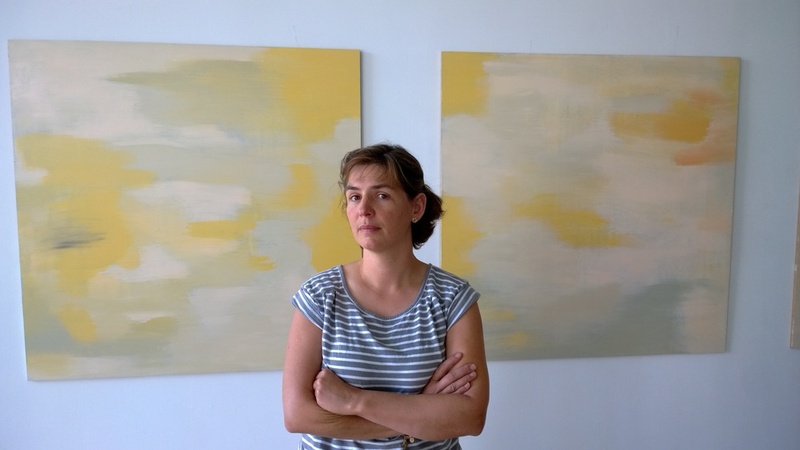 Farnum is researching mural work – she is currently studying mural technique through the City of Philadelphia Mural Arts Program– and a number of new pieces are like moveable murals. Born in Massachusetts, Farnum received a B.A. in photography from Bard – she is a fourth generation photographer. She also studied at the Lacoste School of the Arts in Lacoste, France. She went on to receive awards for her photographic work while exploring other art mediums. Her artistry also has been part of her business “Trafficking in Beauty” as a florist and landscape designer for restaurants and events. In addition to her work as an artist, Farnum has been instrumental in a number of philanthropic and community endeavors: a founding member of the Carnegie Picture Lab, part of the Sherwood Garrison Creek Stream Restoration Project, artistic collaborator for the creation of CURB (Creating Urban Riparian Buffers) Program. For more information please contact Kirsten Telander at 509-540-2555 or telandergallery@gmail.com, or visit Telander Gallery at www.telandergallery.com or on Facebook: Telander Gallery. December 1, 2013, and on going. This past winter there was the opportunity that changed my directional pull. "Yes," I said, to an unknown. While building an installation in the AMO lavatory, walls were transformed into a multilevel experience. The top of the walls were painted in the light, the light that happens at the end of the day, when anything is possible. The bottom of the walls were an exploration into raw pencil and plaster drawings. The two roomed, two themed, show was built in response to what I was learning inside the installation. In the AMO space Walls were built to encompass. Nooks where constructed. Alters were raised. All this was juxtaposed with an illustrated journal sequence. A wink and a nudge, and a wee bit of "ah yes," the whole matter came along next door in a space called, Heaven.